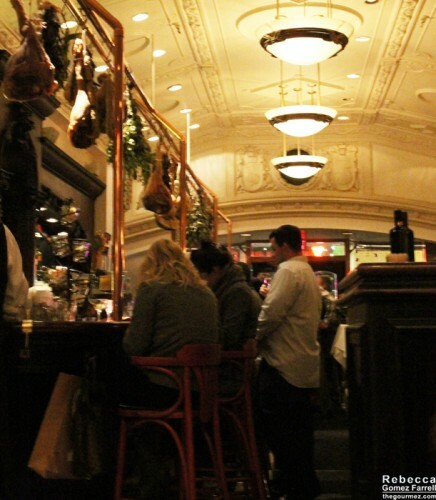 Kuleto’s bills itself as “authentic San Francisco,” featuring Northern Italian cooking with an American twist. Being new to the Bay, I can’t speak to its authenticity, and I personally hate the idea of calling anything authentic (happy to have that discussion anytime!). Regardless, I was pleased with all aspects of our dinner. The only confusing part was not realizing the host stand was in the middle of the restaurant. But after a couple of regulars helped us on our way, we were seated rapidly and at a booth that overlooked the curing meats and herbs hanging from the bar. If you haven’t figured it out by now, I am a fan of dark woods and crown molding. Thus, Kuleto’s interior appealed to my sensibilities. 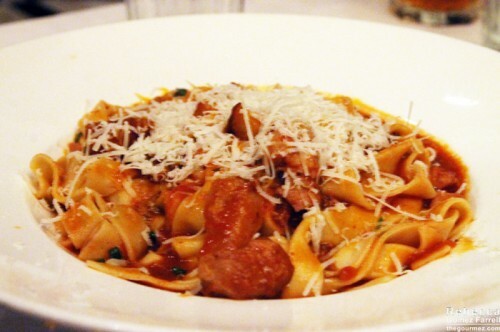 It has the cozy vibe of a fancy Italian restaurant that is likely to play Rat Pack music overhead, but thankfully, Kuleto’s is classy enough not to. 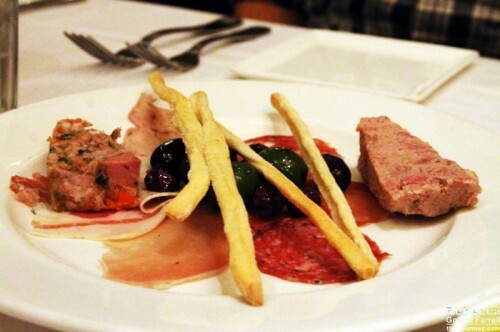 We started our meal with the charcuterie sampler. Kuleto’s does not skimp on the bread basket! 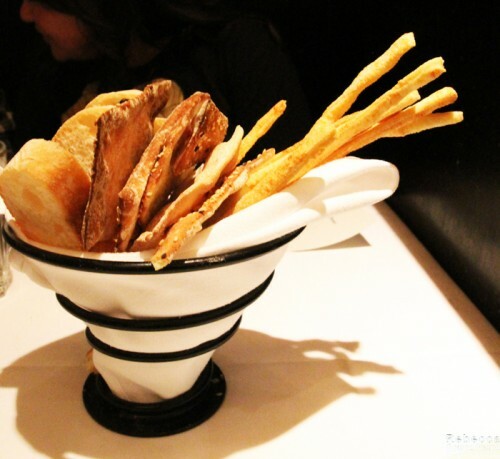 Each type was flavorfully baked, but the parmesan-romano breadsticks were outstanding in crunch and sharpness. On to the entrees! Excuse the blurry picture of my husband’s pasta, which was a special of the day featuring pork belly and a tomato sauce with wintry spices. I often find pork belly too fatty, but this was an excellent use of it as the small chunks dissolved instantly on my tongue. The sauce was similar enough to a typical bolognese to feel comforting, but the pie spices gave it a fun twist. My entrée was a duck breast from Liberty Farms with polenta, rosemary pear conserva, and watercress in rich braising juices. The negative first, which is that I have no idea what the watercress was doing on that plate. It was too delicate to hold up to the earthy braising sauce poured over it, making it seem like an afterthought to me. But the creamy polenta was divine. I want to say it was made with gorgonzola, but I can’t confirm that other than to say whatever cheese was involved sang with each bite. 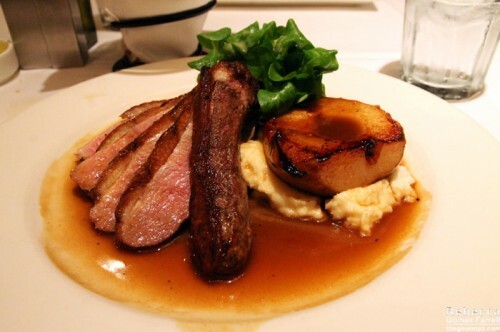 The pear was attractive and a subtle complement to both the polenta and the duck. That duck was the best I’ve had in a while thanks to its crispy skin and excellent flavor. Leave off the watercress, and I wouldn’t be able to stop praising the dish. 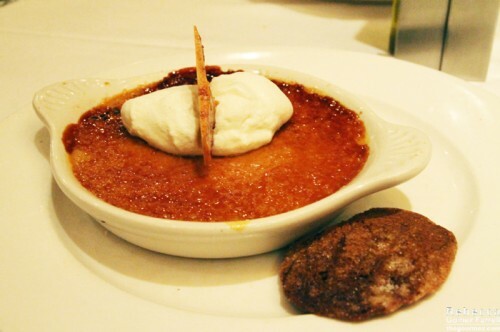 The meal’s end came with a pumpkin crème brûlée, caramelized-bacon toffee, and white-peppercorn gingersnaps. Totally worth it. The savory toffee played the role sea salt often does with chocolate these days; it enhanced the flavor of the softer pumpkin brûlée. I wanted more personality from the gingersnaps, but they were only a bonus feature. If Kuleto’s is the San Franciscan landmark they claim to be, it’s a deserved reputation. I can definitely recommend it as a dinner destination for people needing a break from the Union Square crowds.